March continues with story telling or narratives as the Strategy of the Month. All learners have stories to tell but some may need special teaching to be able to express their stories. Goals for the beginning communicator can and should include narratives. Personal narratives are a good place to begin but any type of narrative can be taught with structure, routines, partner support, prAACtical strategies. Robust communication includes story telling. Yes, beginning communicators need to be able to express wants and needs however, authentic and comprehensive language involves much more. The quicker we start teaching, the quicker beginning communicators (or anyone) can learn. Remnant Books are a visual and tactile way of telling stories by recording important events. Learners can help choose items from meaningful personal experiences which serve as a reminder of stories to tell. Create routines and visual supports to collect remnants to be used later to be added to a book and to be used in narratives. When routines are developed for collecting items, we have been amazed when items are chosen and spontaneously added to the ‘story’ box (book, folder). The remnant books can help communication partners co-construct narratives because they serve as a visual cue of the meaningful personal experience. Remnant books can also be used to help with topic choice when selecting which story to tell. They can even be created with a beginning, middle, & end parts of story organization. The facilitator can gather several remnants from each part of an experience and then the learner can self select which remnants are added to the book. At the beginning, the learner may be choosing any item, but this is appropriate because any choice would be correct. However, with prAACtice in many opportunities, learning takes place and the choices become more intentional. We have to always keep in mind, this is teaching, assessment is for other times. Visual Scene Displays (VSDs) can be personalized photos that are be set up with sound files of specific messages/hot spots that the learner accesses to add information for a narrative. VSD’s can be created in many traditional AAC devices, some AAC apps, but even in Power Point and other computer based technologies (notice the sound clips in this power point display). Photo Stories– Traditional or electronic photo albums can serve as great narrative tools for the beginning communicator. Taking a photo or sequence of photo’s be the visual cue to share personal narratives. Just add appropriate symbols and text and the learner’s role can begin with turning pages and accessing the ‘sound’ in electronic stories or selecting a symbol before turning the page. The communication partner provides relevant comments or open-ended questions. As the learner participates in and understands the narrative routine, more complexity of language expression can be added. Link Meaningful Experiences– Link experiences language as well as to remnants items, photos, and sounds. Take meaningful language experiences to the next level by tangibly recording events with objects, pictures, and sound. Develop Predictable Narrative Formats- Have options to begin narratives with familiar phrases or vocabulary that lead communication partners to participate in the story telling interaction context. Some key phrases can be “Let me tell you about ______”, “Did I tell you about _____”, “You won’t believe what happened”, etc. As the learner has PrAACtice with predictable formats, they can begin to assemble the narrative by choosing the ‘beginning’ page, or ‘first’ statement. Pair Narratives with Daily Routines- There is definitely a lot to teach to beginning communicators. It is easiest then to add opportunities for narrative PrAACtice into activities that will be naturally occurring throughout a day. Short narratives can be co-constructed as part of circle time in school, as an introduction when students change classes, after lunch, etc., at the beginning or end of a speech-language therapy session, or in any routine that makes sense to an individual learner. Spend some time developing the narrative routine and many learners will learn to remind you if you should forget. 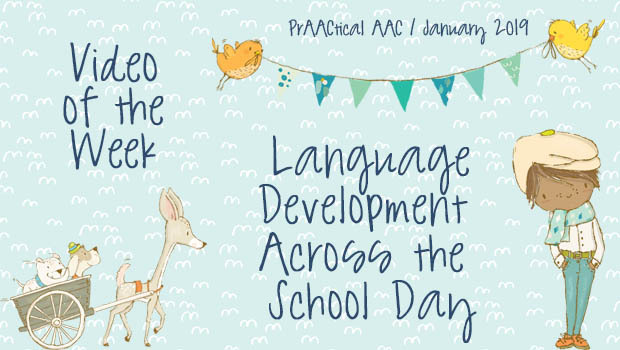 PrAACtice or Provide Frequent Opportunities- Provide many opportunities for narratives throughout a day. Some narratives might only be one ‘page’ or ‘remnant’, other narratives might be more involved but since communication usually involves telling stories all day, beginning communicators need at least as many opportunities to learn. Use Visual Supports & Story Vocabulary- Begin using visual supports and story vocabulary to show narrative structure. Put remnants and photos into beginning middle and end boxes/story frames/story maps. Do story scavenger hunts. Model narratives and take turns. Bonus– Remember all the language facilitation strategies and reinforcement strategies that work so well with teaching communication and language. They will take the story telling/narrative learning process to the next level. It is really great to be part of developing narrative skills for ALL learners. We are always thrilled when a beginning communicator gathers a remnant for a story, or opens a photo album and waits for a comment by their communication partner. We continually see beginning communicators add information to narratives and become integrally involved in the story process & that adds whole new narratives to our days. Thanks so much Jane!! Means a lot coming from you. It is a really fun skill to work on because once the students learn the expectations, they often surprise you with the topic choices, or even what they want to say about the story. This is wonderful. Just what practitioners need to know, especially for some of those challenging kids on the Spectrum. “Where do I start?” Well, you’ve told us where…and how. Thanks very much for your comment. We find if we make the structure of language visual, use aided language input and develop natural authentic routines the kids go far and surprise us with their spontaneous additions and variations to narratives. Again thank you so much for your comment, we follow & love your work. I am often humbled by practitioners who take a little mustard seed of an idea and expand it beyond anyone’s dreams. Thank YOU. Great ideas to develop narratives….this can be a challenging skill for all students! Loved the remnant box! This is great information on a skill I always try to get into IEPs for the kids I serve! Thanks. Thank you Robin and Carole for bringing awareness of the importance of personal narratives for language development, even for beginning communicators. Your ideas are so solid and applicable. Thanks for all the hard work you put on this blog daily. It has become an essential tool for AAC practitioners!